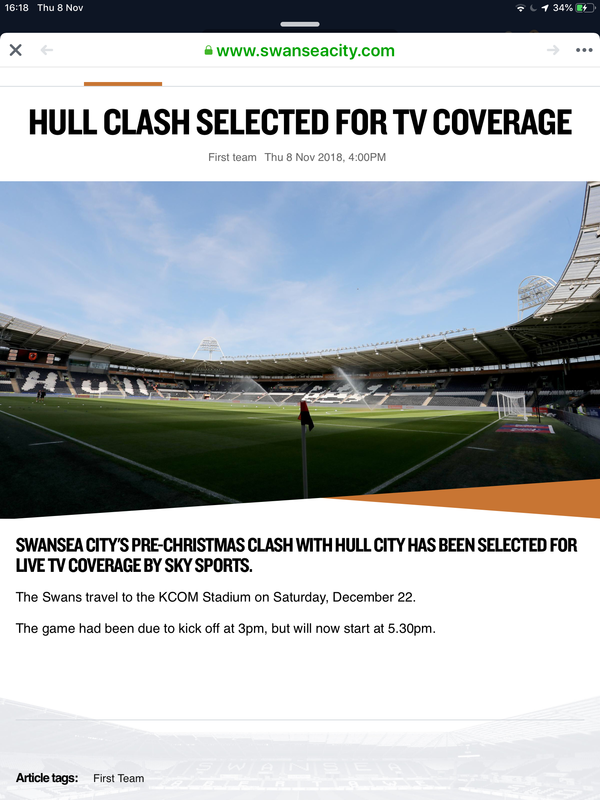 Hull game on 22nd December now changed to 5.30pm kick off. What a game to change just before Christmas. Clashes with the Scumdiff game on sky at the same time ! So a cracking afternoon in front of the tele here In Peterborough! Live TV great for those that can't make it but a bit of a nightmare for travelling fans on the 22nd. By the way what is the sky obsession with Leeds and Derby who are on three times each over the Xmas new year period! Whoever makes that trip, hope the club reward them with freebie such as food n drink etc. Happy days. Saturday evening before Christmas, work done for the year, Swans and beer. Lovely. The club should give the fans a xmas present, Free bus and ticket. Charge for it, then refund it a few days after the game, to make sure fans turn up. Or any players could stump up a few quid. I’ll bring a few tins over to yours. I think this obsession has been covered before, Leeds are top at the moment, Derby in the top six, why would sky not cover in form teams. Plus more revenue for the sponsors including betting firms because of far bigger population compared to us and other smaller populations, well that's my take on it anyway. From Barry to Peterborough, you poor b*stard. No wonder you are barking. I think the later kick off is far more helpful for travelling swans fans this close to Xmas.